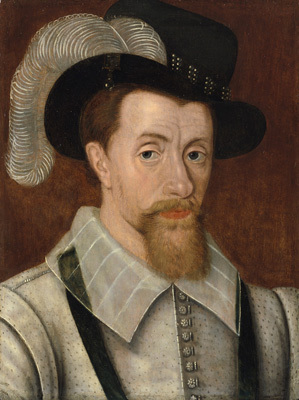 This portrait of King James I derives from the portrait type produced by John de Critz (1555-1641) at the outset of James I’s reign. It was the first portrait of James as King of England, and as such was in great demand, given the desire to show loyalty to the new Stuart regime. Good quality versions can be found in numerous important collections and museums, such as the Dulwich Picture Gallery, the Prado, and the National Portrait Gallery. This small panel would have been commissioned as a ‘corridor portrait’, an image intended to hang prominently in a private house not only as an expression of loyalty to the new king, but, as the culmination of a series of English monarchs, loyalty to the crown itself. James is wearing the blue ribbon of a Knight of the Garter, the pre-eminent English order of chivalry. Elizabeth I, James’ Tudor predecessor, was rarely portrayed in her Garter paraphernalia. James, however, as the new Scottish king of England, was clearly keen to display his Englishness with the Garter, and from this time onwards all English monarchs were generally portrayed with the Garter. The accession of James to the throne of his cousin Elizabeth represented a considerable personal and political triumph. It could be regarded as a vindication of ambitions of his mother -whose memory James soon honoured by erecting a great tomb for her in Westminster Abbey and by obliterating Fotheringay Castle, the scene of her execution- and at the same time the acquisition of a territory whose economic and diplomatic power was considerably greater than that of his own. James's intentions in this latter direction were commendable, as he wished to set up Britain as the Peacemaker of Europe and chose Beati Pacifici (Blessed are the Peacemakers) as his personal motto. His ambitions in this were frustrated both by the contrary desires of the other parties and by his reliance on the ill-chosen and politically unskilled favourite, Buckingham. Although his rule was outwadly stable, many of its disputes, such as the limits of royal prerogative and parliamentary power, were a rehearsal of the bitter controversies that would unseat his son King Charles I. Nonetheless, the early Stuarts are also remembered as the most dedicated royal artistic patrons since the early reign of Henry VIII, and although King Charles I is acknowledged the greatest Maecenas, it must be remembered that it was during the reign of his father that Inigo Jones and Sir Anthony van Dyck began their careers at the English Court.